When arranging furniture, it’s true that how you place your pieces has a huge impact on how large the room feels, not to mention on the overall design. While it may seem easier to simply put each piece into the room based on where it easily fits, there is a lot you can do to minimize a cluttered look, expand the sense of space, and make the whole room more inviting. Here are the top 3 furniture arranging mistakes exposed, and how to fix them yourself, today! Photo below by ‘Crate & Barrel‘. By far among the most common furniture arranging mistakes made is to simply line the walls with all your furniture. That works great for a bowling alley, not so great for your living room! Problem: While this may leave a lot of space in the middle of the room for kids to play, it does nothing for your conversation areas. And frankly, kids can play anywhere. We grown ups need to be able to chat without sitting 10 feet away from each other. A room that is arranged for good conversation also looks more inviting from a design perspective. Friends and family are just drawn into the welcoming space. Create groupings of seating areas. Bring the couch and chairs aways from the walls and try to keep conversation areas no more than six feet apart. Remember, 18 inches is plenty for the average traffic path. You might even find that after re-arranging, you find pockets of space you didn’t know you had! Room for a secret (and not so obvious!) play area for the kids, a reading chair or a small writing desk for bills. ‘Apartment Therapy‘ has several good furniture arrangement ideas for a small space. In this example, they placed the furniture on the diagonal to allow conversation areas and also a good traffic pattern. 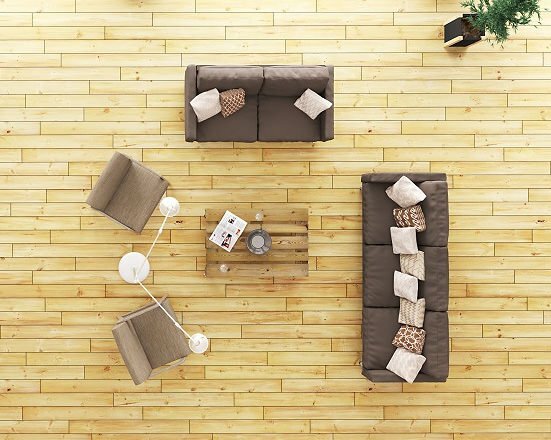 Placing your furniture to either block, or not take advantage of your natural focal points is mistake number 2. If you walk into your living room, and half your picture window is covered by your sofa, or your fireplace can’t even be seen until you are sitting right in front of it, then you know you have made this mistake. 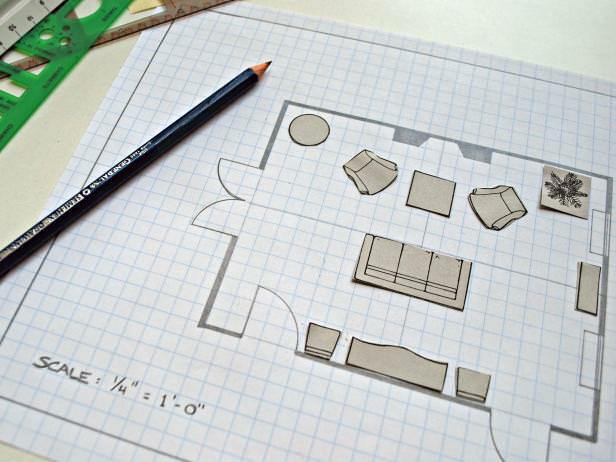 Problem: Your focal points are the center of a room design. When they are blocked, then the design of the room lacks any feeling of order or direction. The eye simply does not know where to look first, which creates a chaotic feeling in a room. This one is pretty simple to fix. First, discover a main focal point in your room, and then pick one or two secondary focal points. Orient the furniture to allow those features to be the star of the room. Big windows? Let that light in! Pretty woodwork? Make sure it is seen. Occasionally, such as in the bedroom, a piece of furniture or art acts as the focal point. In that case, orient the rest of the furniture towards that. Now, this does not mean that every piece of furniture needs to point straight at the fireplace like soldiers in a row. Just that the focal point becomes… well, the focus! This example from ‘Zillow‘ shows how they arranged the furniture to make sure to take advantage of those gorgeous windows, without blocking them. This furniture arranging idea from ‘How To Decorate‘ shows how the furniture all treats the fireplace like the main player. For smaller homes, a big furniture arranging mistake is to put too much furniture or furniture that is too small-scaled in a room. Problem: When a room feels stuffed with furniture, it creates a cluttered, crowded feel. Some people try to put really small furniture in a small room thinking that will solve the space problem, but it ends up looking fussy with lots more little details for the eye to seek out. This in turn actually makes the room look smaller. On the other end of the spectrum, they bring along a giant sectional or king size bed from their old home, and just because it technically “fits” into the room, they keep using it. When there is no negative space, a room looks cramped, no matter how much seating or sleeping space it has. The best solution is to choose furniture that is slightly large in scale, but less of it. 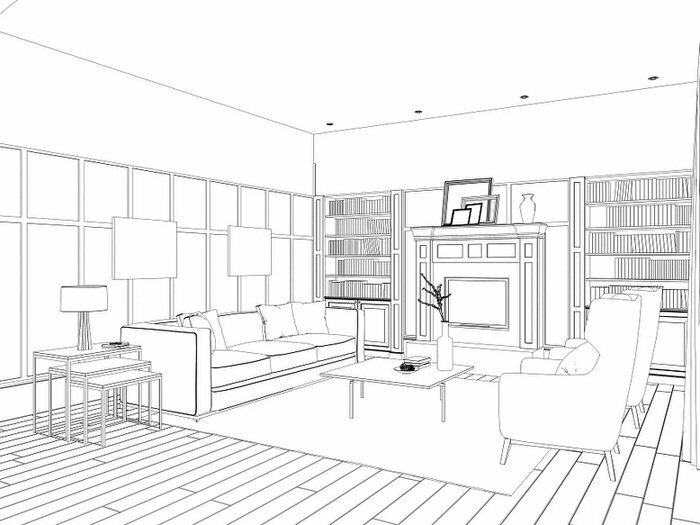 This will allow the eye to take in the furniture quickly and move on, tricking the mind into seeing a larger space. If your budget is tight and new furniture is out of the question, try buying pieces off Craigslist or from thrift stores and then check out our post on DIY Painted Furniture Makeovers to create a piece you will love! 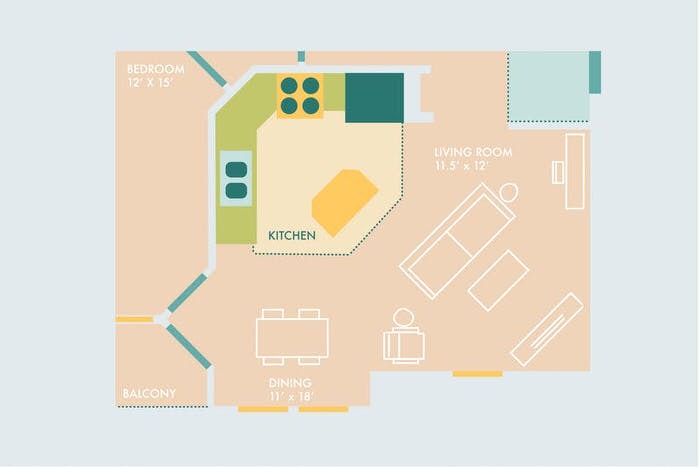 Notice this room furniture layout example from ‘Ashley Furniture‘ shows how they used just enough mid sized furniture to provide seating. 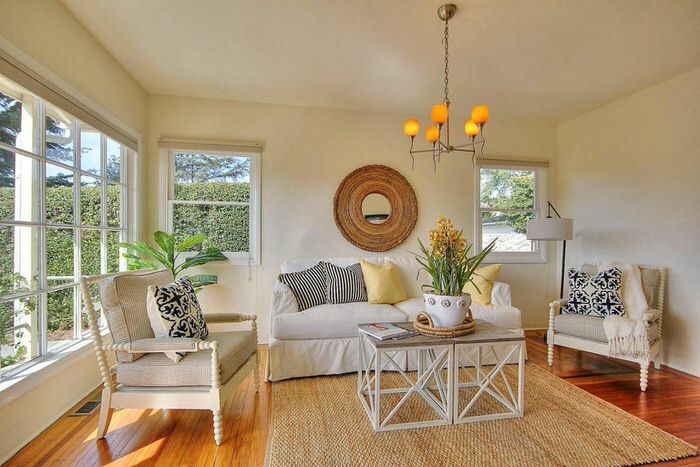 They have a coffee table, but eliminated the end tables to prevent a cluttered look. 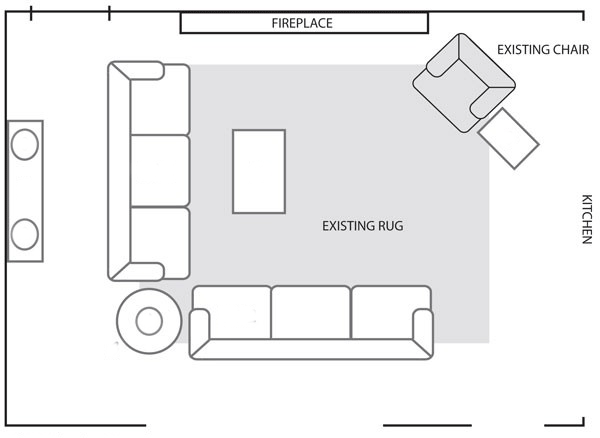 Also from ‘Ashley Furniture‘, this example shows how there are good conversation areas centered around the fireplace. The whole look is cozy and inviting. This room from ‘Houzz‘ used a mid sized sectional , but then brought the room arrangement away from the wall using two easy to move ottomans for extra seating. Larger scale furniture, but not too much of it. 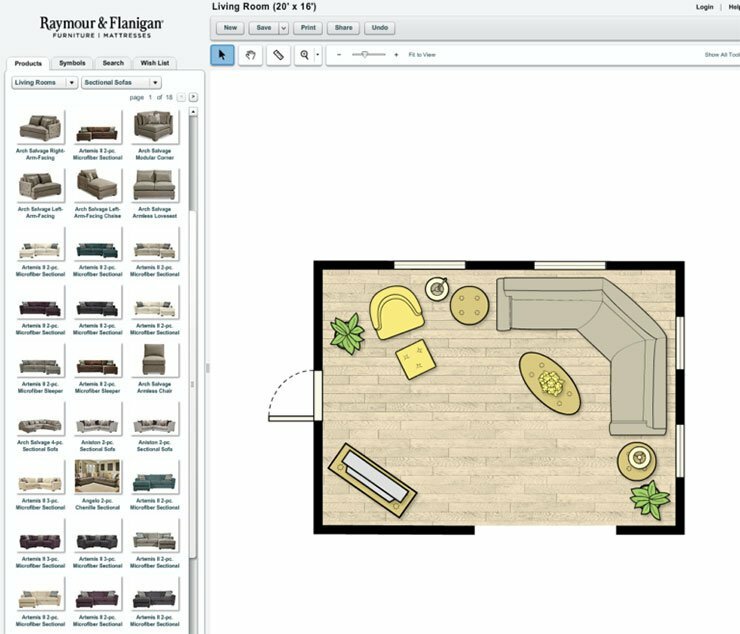 Try this virtual room planner from ‘Raymour & Flanigan‘ if you need a good online furniture arranging tool. It lets you save many different versions of each room if you choose so you can consider different arrangements. Here is a screen shot to show you how easy this program is to use! When a room flows with good design, it feels good. When it feels good, you feel happier. Isn’t that what we’re all after when we decorate our homes, large or small? So if you are making these furniture arranging mistakes, now is the time to fix them. It might not take any money at all for a whole new room design! Try our posts on DIY Furniture Knock Offs and How to Reupholster Almost Anything! yeah! great topic to choose. Thanks for sharing this informative post and the fixtures and mistakes you have mentioned in the article are awesome. I am loving while reading this post. It’s interesting how large the space is in the “small room” example. If I had that much space, arranging furniture would be a lot easier. Sometimes putting furniture along the walls is the only option, if you want to be able to walk through a room. It’s not very aesthetically pleasing, but it’s functional. Great advice… but those of us who are visual learners more pics (sketches are even better) of before and after would be EVER so helpful! Thanks! Also, the I was wondering about the sketch you have at the top. Would that be considered a good lay-out? I am a visual learner so it would be helpful if you could put in pictures of the blunders and possibly pictures of the corrections to the blunders. i have a long narrow living room. way too big i won in a contest flat screen tv couch love seat two chairs and moveable firepace. not easy pulling this off in a tiny space. probably need smaller furniture but the big stuff is comfy. se we squeezed it all in anyways and suprisingly still have room to front door and hallway entrance..tiny 50s house with bad layout. How do I place furniture in small rooms, with doors and large archways? I can’t give up the archways because it makes the rooms feel tiny. One room I have no idea what I can do with it. The other has an archway on one end, patio doors on the other and a bedroom door 2/3 the way along a third wall. That roma is 11’×15′ , and definitely feels like a bowling alley. The idea that people don’t need more than 18″ to comfortably pass between/around furniture applies to the able-bodied. I have terrible balance and space perception (I think people/items are closer than they really are so I fall trying to avoid them) due to cerebral palsy, so the more room between things, the better. It’s easier for my friend with RA to negotiate with her cane, too, if things are further apart. We have a rattan settee in a different part of the room that we bring closer when people visit– that way we have the conversation space without falling over the darn thing on a daily basis. Movable, light furniture with multiple finctions is helpful if you or guests are disabled, and if your guests don’t walk easily, be willing to move furniture to give them a bit more space. Great points, thanks for sharing your perspective! be sure furniture isnt so light that people tip it over. those with a hard time walking need to lean on things.and need sturdy furniture and of course with room for canes wheelchairs etc. have to make exceptions for space. my neighbor had a stroke so when he came to visit he didnt go far to our porch and we had to ensure clear path and sturdy seating for him, this year we enclosed our yard and he isnt getting around as good so hasnt stopped by. What do you do when your husband INSISTS that furniture MUST be facing the tv??? I’m ready to just throw the TV out, because it’s killing me to make a TV a focal point…and over the fireplace TVs are just too icky to me. Hi LM. I have had a rule since we bought a house — no TV in the Living Room! We have ours in the Rec Room in the basement — or if you are lucky enough to have a main floor family room. But I figure my guests are coming to visit US — NOT our TV. Not all of us have “family” rooms and “living” rooms and “rec” rooms. some of us make do with a living room, kitchen and bedrooms and that’s it. I’d recommend an armoire that can close up to hide the TV.